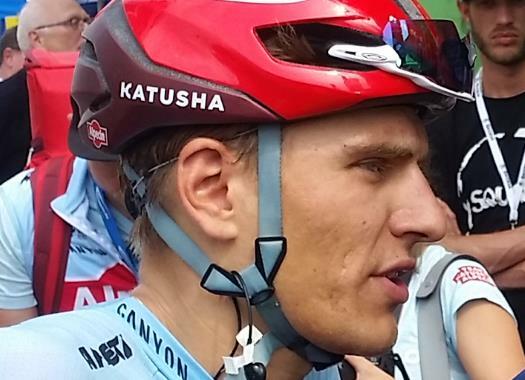 Marcel Kittel was slightly disappointed today with a fifth place in Rund um Köln. The race was expected to end in a sprint between the German sprinter of Katusha-Alpecin and Bora-Hansgrohe's Sam Bennett. The Irishman confirmed his status, while Kittel did not even made it to the podium. However, the German does not seem to worry about this as his focus lies on being successful in the Tour de France. "I felt bad all day and then I got cramps in the end, that's why I think I did pretty well with a fifth place," said the rider to CyclingPub.com at the end of the race. "I cannot say that my legs are really fresh. I came back Monday [from altitude training], I have a jet lag and I also really trained a lot. Because of that, I think it goes pretty well. We started well as a team but when it went all out and in the final 150 metres I couldn’t do it anymore, I only went slower then and I even got cramps in my thighs. I had to go through that. It was a hard race, a tough day. But actually, that is exactly what I need for the Tour de France." "It was a good test. A tough return to racing. I am not sad, I would have liked to win of course. I also started my sprint from a position from where I am hard to beat with normal legs. It is okay though. We did a good job with the team. There is another race on Wednesday [The Tour of Slovenia] and I think we will see some good things there." An explanation for Kittel's sprint might be the altitude camp he recently returned from. His peak form is planned for the first week of the Tour de France, and he is still building up to that. "The legs are coming back. I believe this is normal with the tight travel to Cologne. We said from the start that it was going to be difficult coming out of the altitude camp," he explained. "You never know exactly where you stand then. Also because the Tour is a week later this year, we did a lot of racing with little intensity. Taking all of this into account, we didn’t do so bad today. The most important thing was that everyone suffered today and that it hurt again after the training." When asked about the ambience of the race, Kittel responds positively. "The course rolls pretty well, and I say that as a sprinter. The race is nice, through the Bergisches Land and also in Cologne. The people are into it, I think it is nice. It was a pleasure to be back in Cologne."